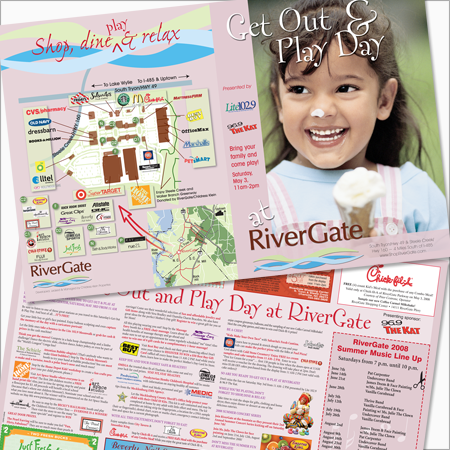 The Rivergate Mall newspaper insert is part of a series where The Charlotte Observer partnered with Media Power Advertising to produce inserts for three Charlotte shopping malls. Media Power Advertising approached The Observer with the concept of pairing their PR skills with The Observer’s direct mail program. They wanted to work with one designer who had a clean, professional style and whose design would appeal to upscale shoppers. I got the nod. We had a very comfortable meeting and got to know each other well. The ladies at MPA were easy-going but professional. They told me what they wanted—which is always nice, no designer likes a wishy-washy client—and off to work I went. I will give the ladies credit, they picked good photos for the cover designs. 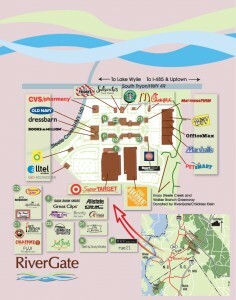 I particularly like the photo for this RiverGate Mall piece. That little girl’s expression and the ice cream on her nose set a fun mood for the Get Out and Play Day event for the mall. I lifted the pink from the little girl’s outfit to use as a background for the cover. MPA liked it so much they wanted to use it throughout the piece. This became the pink mall insert! An advertising agency had designed the logo and used the Ex Ponto MM font for the tagline. Quite familiar with branding, I tried to keep the look the agency had come up with (bouncy and fun), while also pleasing the PR firm with whom I was directly dealing. Luckily, the bouncy fun font lent itself well to the shopper’s appeal that MPA wanted. 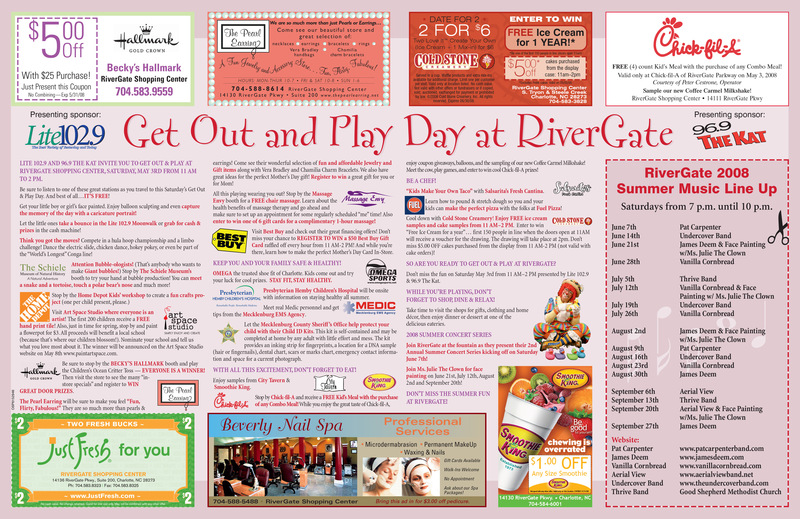 The agency’s tagline was “Shop, dine & relax.” We took it a step farther with the “Get Out & Play Day” theme and changed it to “Shop, dine, play & relax”, which you can see on the back cover. The back cover on all these inserts needed to incorporate a map of the mall. Not exactly my decision, but as a designer, you have to choose your battles. They insisted, so I relented. Now it was my job to make it as appealing and useful as possible. I used one of the colors from the waves in the mall logo for the map background. Next, we went on a logo search to add the store logos to each of the buildings. The client supplied us with an architectural drawing of the mall. Unfortunately for me, some of the buildings had not been built at that time! I auto-traced the architectural rendering in Adobe Illustrator, then used the 3-D effect so the buildings would pop out from the map. I selected one of the buildings, re-sized and finally repositioned it to make the newer buildings. The inset for the map came from the editorial department at The Observer. Since the editorial department doesn’t want their work used for advertising, I had to convince them to give it to me, then re-style it so that it didn’t look like it came from their department. Sheesh! The inside of the insert was a project all in its own. The sales department’s job at The Observer was to sell ads which go on the inside of the insert. These ads go along the top and bottom of the piece. So, not only did I have to design the insert itself, but each of the ads which went in it, too. To further complicate matters, the PR firm had a boatload of copy which was needed to describe the events. Not only that, but every time a company was mentioned in the copy, they wanted to add that company’s logo. Oh, but I’m not through! There had to be a headline, of course, and the main sponsors’ logos needed to be prominent along with the header. Finally, they wanted a cut-out feature for the summer music line-up! I handled the logos in the copy by embedding them in the copy itself. This allowed the logos to flow with the copy, so that when it inevitably changed, the logos would stay with the right paragraph. It did take quite a bit of tweaking to strike the right balance of logo size and copy size to make it all work. I used a four-column grid to get the ads, copy and cut-out to balance. Worked nicely! Since we were using a monochrome color palette for the most part, I used different opacity and saturation to give me more options to differentiate the sections and to add background art. The pink insert began to take shape! The ads were usually the last to come in. The sales staff needed to sell the ad space, then get the copy and any artwork that needed to be included, then get all that to me. I then had to build the ads and insert them into their appropriate places (determined by the salesperson). Some of the ads came in camera-ready. Naturally, some were built to the wrong size! Yes, these inserts were an undertaking! I’m told that all businesses advertising in the ad spaces were rewarded with a spike in sales. It makes sense. 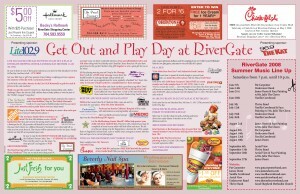 This insert in particular covered the events taking place over the summer at RiverGate Mall. 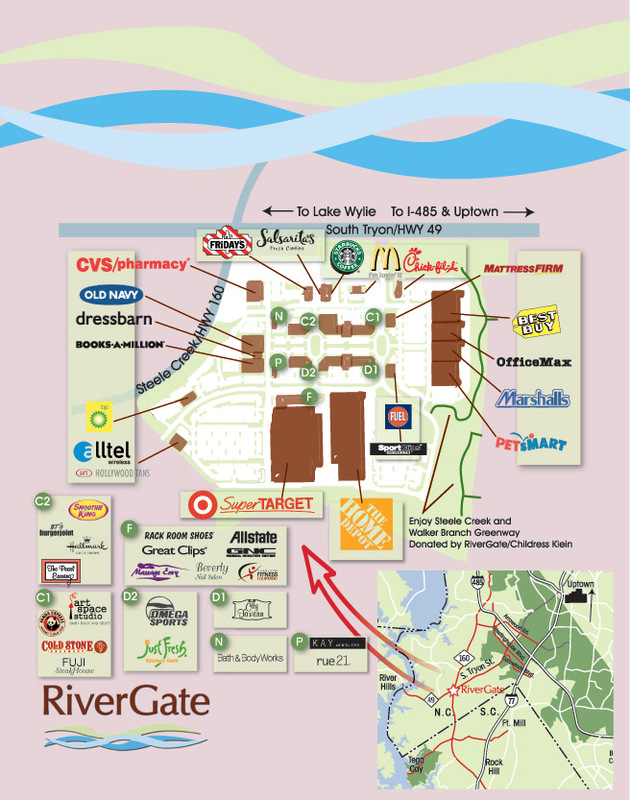 If your business was located in this mall, having an ad prominently displayed in an insert which was delivered to shoppers in the area would certainly give you an edge over the competition. All in all—even though this piece took a lot of hard work to pull off—it was successful, which makes it worthwhile to a designer. Goes to show that your work means something. The sponsors put on wonderful events, the mall had a successful summer, and the businesses who advertised saw profits. Good design is good business.